I grew up in southern Idaho and lived as a lonely Presbyterian among the Mormons. My best friends included Mormons, and we tolerated our differences in doctrine because we liked to play together. I didn’t feel any prejudice until I tried out for the drill team in high school and didn’t make the cut because the advisor and all the team members were Mormons. It also could have been because I was an uncoordinated goofball. 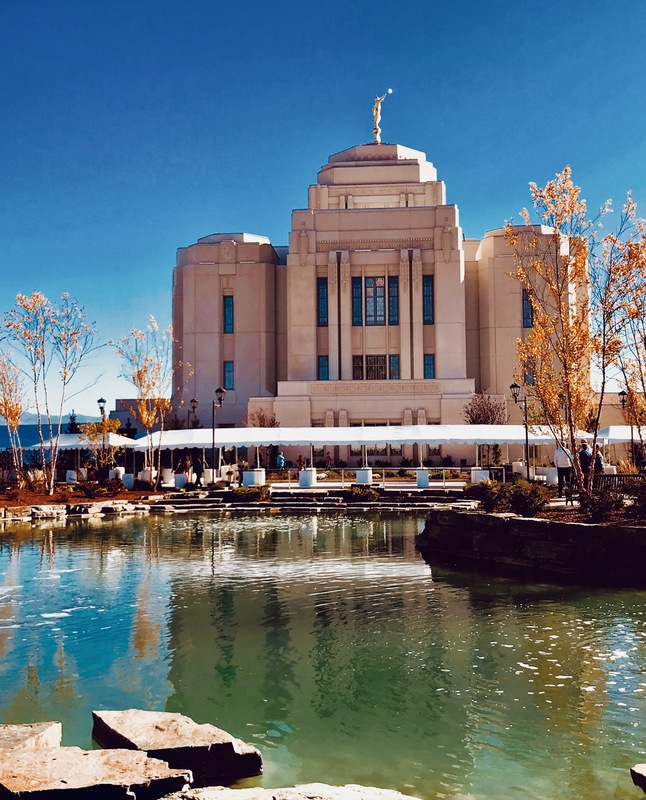 The Meridian Temple offered an Open House for the gentiles to see the inside before the building would be steam-cleaned, purified, and closed so only qualified members could enter. I registered online and appear at my designated time. No purses or cameras were allowed, so I packed my car keys into my pocket and hid my bag in the car. 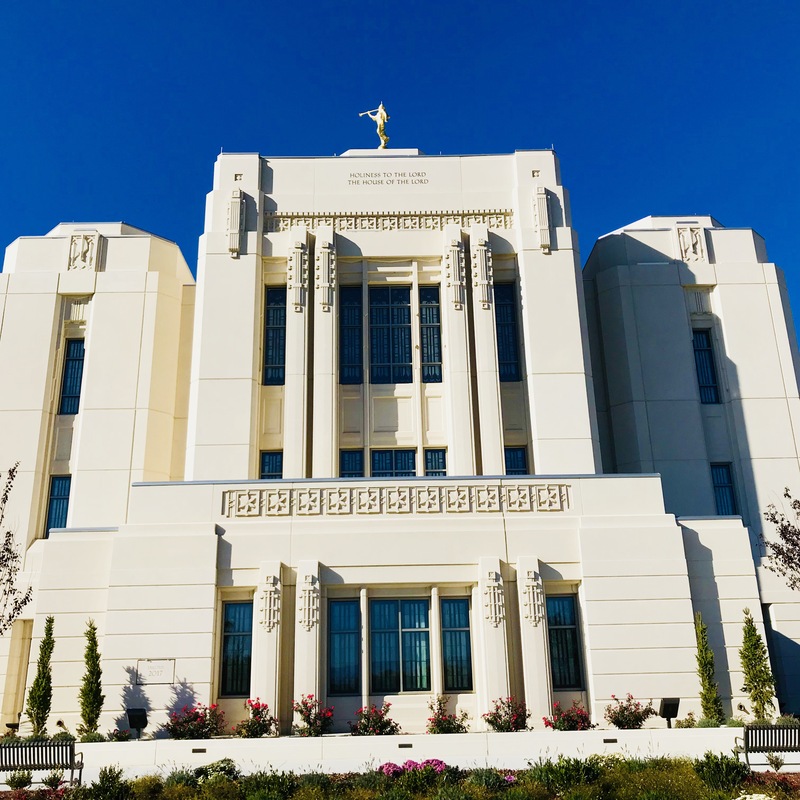 We were ushered into a classroom in the meetinghouse next to the temple, and soft-spoken missionaries provided details and showed a 12-minute video about the Mormon Temples. We were led in groups of 25 down the sidewalk to the entrance of the temple. Pleasant children covered our feet with white booties. By then, I had gone 20 minutes without my cell phone or access to the Internet, and I fought the anxiety. I felt calm and peace looking at an enormous painting of Jesus greeting us as we approached the ornate doors. Our group entered the building, quietly and respectfully. I noticed the gleaming marble floors, plush ivory-colored carpets, and Art Deco architecture abundant with gold-leaf paint framing the wall panels. The polished brass handrails gleamed under the brilliant light from countless fixtures in the high ceiling. Volunteers stood every few feet and gently pointed to the route we should follow. Our lovely tour guide greeted us and led us down a marble staircase to the lower chamber so we could see the elaborate and pristine baptismal pool that was balanced on the backs of 12 stone oxen representing the 12 tribes of Israel. Mormons are serious about ceremonies that include baptism for the dead because they believe baptism is required to enter the kingdom of God. My two children had been baptized, but the procedure only involved some cold water splashed from a bowl onto their foreheads. “Where’s the diving board?” asked Stickers. “Just think of all the love that is offered when faithful Mormons do their temple work,” replied Sunbeam. Our tour guide motioned for us to follow her into various instruction rooms. The tall walls were covered with enormous paintings of local landscapes and pastoral scenes. Many rooms contained altars covered in lace surrounded by upholstered kneeling pads. I was amazed by the glorious windows inlaid with stained glass showing intricate designs and white lilies. The tour passed through the Sealing Room where, according to Mormon beliefs, a husband and wife are united for this life and forever. They believe families will be together after death. We walked up and down several staircases. I counted 200 stairs in all and was grateful to have a nice workout on the tour. Elevators were available for people who couldn’t navigate all the stairs. We entered a magnificent chamber known as the Celestial Room. The pivotal attraction was a car-sized chandelier, dazzling with countless crystals and white lights reflecting off the alabaster walls. I wanted to curl up with a good book and a glass of wine but remembered Mormons didn’t drink alcohol. That choice must save them a lot of money. At the end of the tour, we removed our booties and left the building. I scurried to my car and retrieved my cell phone so I could take photographs of the gorgeous landscaping and the dramatic setting. My cell phone vibrated with a new message, and I felt the urge to check my emails. 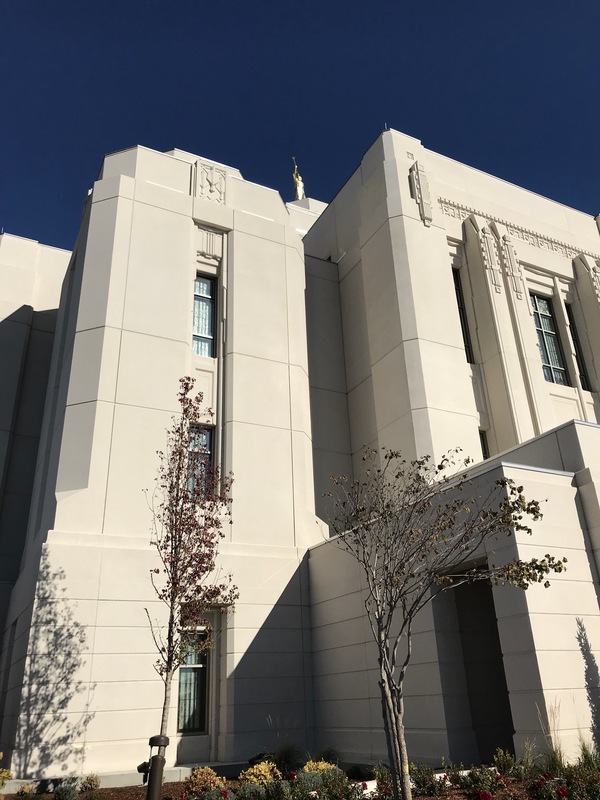 Reservations for tours of the Meridian Idaho Temple at 7355 N Linder Road are available until November 11, 2017. Follow this link. I love that you went to the open house. The temples are so pretty and peaceful. Have a fantastic day.